Welcoming all adults of all sailing levels! Courses are open to members and non-members of ABYC. Registration is now open and spaces are limited. Are you planning to take your boat south, cruise the Great Lakes, or charter a boat somewhere exotic? Or would you just like to improve your cruising knowledge? The Sail Canada Intermediate cruising course is just what you need. This class allows you to complete the theory portion of the Intermediate course, either to gain only the theory certificate, or to continue into the on-the-water portion in the summer. The instructor will make arrangements to complete the on-the-water portion on your own boat, or will help you to find another boat to join if possible. Planning a trip? Want to make sure you don’t run into something along the way? You would be amazed at how many things there are out there that can make your trip go the wrong way….. In this 15-hour course you will learn how to plan a trip for an afternoon of sailing and all the meanings of the things you find printed on the charts. Basic Navigation is an excellent introduction to chart reading and passage planning. This course is a prerequisite for Intermediate Navigation and Intermediate Cruising. Intermediate Navigation is the next step after Basic Navigation. Here is where you really get to build your pilotage skills in this 18 hour course. You will never look at passage plans and running fixes the same way again! Don’t have Basic Navigation certification but do have lots of experience? Let us know and we will help you decide if this course is for you. The Maritime Radio course teaches emergency radio procedures, and everyday operating techniques. Learn all about the uses of marine radios, choice of frequencies, operation, phonetic alphabet, procedural words and phrases, as well as Digital Selective Calling and the Global Maritime Distress and Safety System, (DSC/GMDSS). This Offshore Personal Survival Course will give you a hands-on opportunity for all of this. Whether you are sailing across to Rochester, to the Caribbean or in the Lake Ontario 300….something could go wrong and you could be in a position to use your safety equipment and save someone’s life. ABYC is a Sail Canada and Transport Canada certified recreational boating school. Select summer courses are open for registration! Spaces in these programs are limited. Note: Clinics are aboard a C&C 25 – space is limited! This is the perfect course for someone who has never been sailing before and wants to try it out for the first time. If you aren’t sure sailing is for you, this is the course to take to figure that out. Start Keelboat Sailing is a Sail Canada course that gives you 18 hours on the water to get you started sailing. 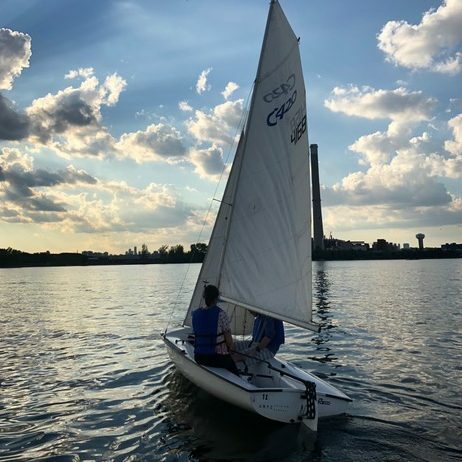 You and your small group will sail aboard a C&C 25 keelboat with a professional Sail Canada instructor, learning the basic maneuvers and the parts of the boat while having fun on the water this summer! You can continue your training with the Basic Cruising course if you wish. outdoor sporting goods store that carries boating equipment. 6:00PM - 9:00PM      START        END       COURSE NO. 9:30AM - 3:30PM      START        END       COURSE NO. Dates: Evenings, Weekends and Weekday classes available. See registration form for complete schedule. For those with some sailing experience. Maybe you have taken an introductory course in sailing, such as Start Keelboat Sailing, or spent some time sailing with others and want to fill in some of the blanks. If so, Basic Cruising is the course for you. Although there are no prerequisites for this 28-hour course, it is very helpful if you have done some sailing in the past. This is the ideal course for new boat owners or those who want to move up to being the Skipper for an afternoon sail. Classes, which are scheduled at various times during the week and on weekends (see registration form below for class schedule), provide both off and on-water instruction and are designed to give students the necessary skills to act as both skipper and crew on a sailboat of up to 35 feet in length, in moderate weather conditions. The course is taught on a 25 ft. keelboat. Includes boat handling under sail, safety equipment and procedures, basic weather and chart reading, reefing and knots, man-overboard procedures, terminology, powering in restricted waters, anchoring and docking, rules of the road. Students who successfully complete the Basic Cruising Certificate will also receive their Pleasure Craft Operator’s Card at no extra charge. Successful graduates are invited to join the ABYC Co-op Program at a low introductory rate to continue their sailing adventures and fine-tune their sailing skills in the summer they graduate. Spots are limited and interest in the program must be submitted upon registering for this course. See registration form for details. Days indicated are for on-the-water portion. Each weeknight course also requires Friday theory class. Designed mainly for those who have recently completed the Basic Cruising Program and want to refresh their skills. This course is essential for those who intend to sail this summer and want to be sure they remember what they learned last year (or years before…). More Time on the Water *New – for those who have completed Basic Cruising this summer and just want a bit more time. Designed for those who complete the Basic Cruising course in 2019. Students often feel that they just need a bit more time on the water to review and practice what they have learned. This 7-hour day on the water allows participants to go for a sail with an instructor on board, wherever the winds may take them! Dates: 5 days across a Monday to Friday. Coordinated with your instructor. Are you planning to take your boat south, cruise the Great Lakes, or charter a boat somewhere exotic? Or would you just like to improve your cruising knowledge? The Sail Canada Intermediate cruising course is just what you need. This five-day live-aboard course is offered on your own boat (or on an owner’s boat by arrangement). Instructor will facilitate this process. Food is not included. Sailors are introduced to the sport and learn the fundamentals while sailing in 420s; these 14-foot instructional sailboats are responsive, fast, exciting and a great work-out. Either course is great for solo sailors, couples, friends, and family members alike. 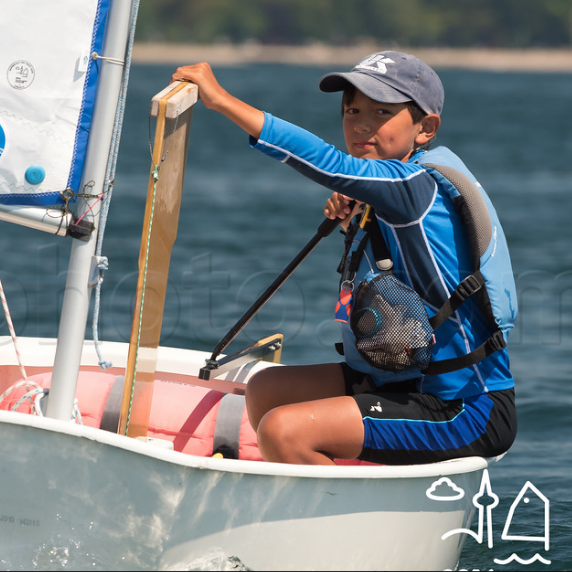 If you’re a keelboat sailor looking to improve your knowledge, a graduate of our junior sailing program, or a parent of a sailing school attendee who wants in on the action, reserve your spot now! If you are unsure of your skill level or have any general questions regarding the programs please do not hesitate to contact our sailing school director (sailingschooldirector@abyc.ca). This program is welcome to non-members too! This adult course will concentrate on the nationally recognized CANSail 1 & 2 program (previously White Sail I, II, & III). This is a basic sailing course for new sailors or those who wish to continue gaining knowledge and experience. You will learn the basic elements of sailing theory (parts of the boat, points of sail, etc.) and on-water skills (safety, crewing, steering, and seamanship). With an experienced Sail Canada CANSail instructor as your coach, you will master the skills and knowledge required to safely sail a dinghy in moderate wind and sea conditions. Evening Courses: We will be offering two sessions for this course, both two nights a week for four consecutive weeks, from 6-9 pm on Tuesday and Thursday nights. Session 1 – June 11 – July 4, Session 2 – July 16 – August 8. Weekend Course: We will be offering one session of this course. It will occur on Saturday and Sunday for two consecutive weekends 10am-4pm. Additional weekend sessions may be offered with sufficient demand. Session runs June 8 – June 16. This adult course will concentrate on expanding skills developed in our beginner course, and is also suitable for those with some prior sailing experience. The course will focus on intermediate level skills in Club 420s as well as an introductory session in singlehanded lasers, providing an introduction to ABYCs coop dinghy program. Intermediate sailors are welcome in all of our other adult dinghy sessions as well. Instructors are certified to teach up to CANSail 3 & 4. Have kids that would enjoy getting out on the water, learning new skills, and making new friends? Check out our range of dinghy and keelboat junior and youth programs.